Artist, printmaker, textile designer and horticulturalist, Angie Lewin's work encompasses an astonishing range of disciplines and techniques, working in wood engraving, silkscreen, lithography as well as creating pattern for wall papers, ceramics and textiles. Her eagle eye for the detail in plant life and nature is at the heart of her work, pattern and rhythm of natural forms, all observed in intimate detail. She is particularly drawn to plants with strong, architectural shapes and lines, choosing the prickly head of a thistle or a crown of agapanthus. Indeed she sees the beauty of plant life year round, from wintry, frozen stalks to the energy of newly emerging buds, dried seaweeds, stones and shells are gathered for inspiration, as well as feathers and pottery. 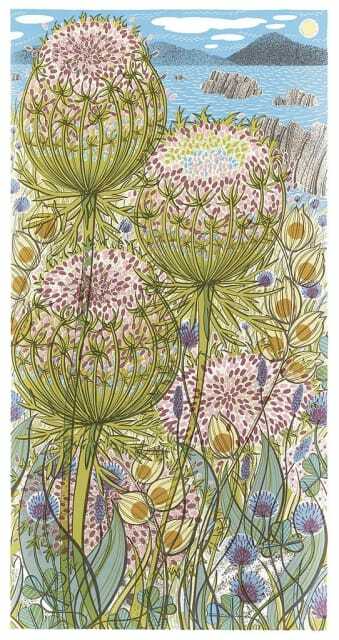 Angie Lewin began her career as a London-based illustrator, she then went on to study horticulture, relocating to Norfolk. This prompted a re-kindled interest in printmaking, as she was inspired by the swaying grasses and salt-marshes of the North Norfolk countryside. Since then, she has relocated once more to Scotland, dividing her time between her Edinburgh and Highland studios. Angie Lewin's work is exhibited around the UK and beyond, and collected and admired avidly. Her recent solo exhibitions include at The Yorkshire Sculpture Park and the Scottish Gallery in Edinburgh. She has recently had her first solo exhibition at Sarah Wiseman Gallery, in September 2015.